A global organization that plays a leading role in enabling K-12 education to prepare students to become creative, collaborative, and productive citizens that will lead future economies and societies into a better and more equitable world. IEA thrives to further enhance learning and teaching processes through the effective use of digital technologies so that educators and youth acquire 21st century skills and become productive members of society. For youth, we promote creative, entrepreneurial, and technological skills; for educators, we promote transformational, active, and inclusive pedagogies. Is IEA’s proven methodology applied worldwide, which blends in with teachers’ working environment and includes both face-to-face capacity building and online continuous support. It enables IEA to track progress of teachers and groups working on their projects. has mentored IEA with the introduction of the first Raspberry Pi initiative in Lebanon and is following its progress with the aim to broaden the initiative in the Middle East and Africa. has advised IEA on it quality and the accreditation of its teacher professional development programs. He has closely monitored IEA’s College of Teachers’ membership and course accreditation of its courses. In addition, he has led the Pi4L research for the College of Teachers. has worked closely for setting the direction and evaluation of the IDO program, which aimed to network Lebanese schools and integrate the creation of media such as video, blogs and wikis at the classroom level. As a leading player in global education, IEA adhered as member of reknowned organizations and networks. IEA designed the first award winning iEARN online professional development courses in 2001. Since 1988, iEARN (International Education and resource Network) has pioneered the educational use of innovative communications technology and teacher professional development to facilitate on-line collaborative project-based learning in elementary and secondary schools in 130 countries worldwide. To date it is the largest K-12 education network in more than 140 countries and over 100 projects in sciences, math, technology, environment, language, arts and humanities. 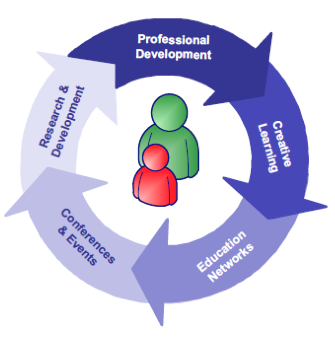 Since 1998 Global Teenager Project (GTP) connects classrooms globally within safe and structured asynchronous classroom exchanges in a structured and proven concept of of Learning Circles. Learning Circles provide are lead by a team of international expert facilitators and enable learners to gain foundational skills in the use of ICT in challenge-based learning, cross-cultural communication and online collaboration. Currently running in 34 countries in six languages. Eliane has 25 years of international education and educational management. Eliane began her career as a teacher in the United Arab Emirates and went on to work as an education consultant with both for profit and nonprofit organizations across the region including Lebanon, Egypt, Jordan, Egypt, Yemen, the UAE, and Oman. Since then Eliane has overseen the development and management of physical and digital exchange programs and online collaborative programs that involved teachers and students across dozens of countries. 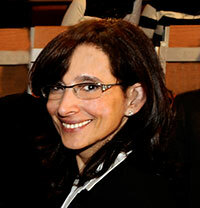 As a co-founder and the executive director of the International Education Association (IEA), Eliane has spent the past 13 years building IEA into an internationally recognized leader in online collaborative educational programs and bringing IEA up to being a member of level The College of Teachers in London, UK. As part of this effort she has overseen the development and deployment of programs that deliver continuing education for teachers and global partnerships for schools, students and educators around the world. Since its inception IEA has served as the home of iEARN-Lebanon with Eliane serving the iEARN Country Coordinator with iEARNs international organization body. Eliane has served as a member of numerous education institutes including the Association for Educational Communication and Technology. Eliane is a Fellow of the College of Teachers in London and a member of the Royal Society of Arts. Eliane is fluent in Arabic, French and English and a sought after speaker at education conferences around the world. 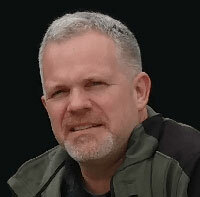 With more than 25 years of experience managing k-12 education programs. 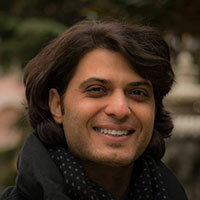 After receiving a Masters in Special Education from the Teachers College at Columbia University, Karim went on to hold positions with schools and agencies providing professional development for educators and advancing student advocacy programs including technology integration, special education training, and social and emotional growth programs. His career has taken him throughout Europe, the Middle East, and the United States where he has served in increasingly senior roles including as school principal in the United States and Lebanon, and as the deputy director of schools at the American Community School in Beirut. Karim has successfully managed numerous school accreditation efforts and overseen major curriculum development programs required to meet higher accreditation objectives. In addition to his day job Karim also served as the mayor of Hammana Lebanon for three years. During this time he worked with the World Bank and other multilateral funding agencies to secure funding for renovation and rebuilding projects that rehabilitated city infrastructure and transformed large sections of the city. Karim speaks English, French and Arabic. He is married with two children and enjoys hiking and other outdoor activities. Since 2011 shifted her focus to science education. She joined the International Education Association where she headed up efforts to develop training and curriculum programs for high school teachers with a focus on Science, Technology, Engineering and Science (STEM). In 2010, she contributed virtually to IEA’s programs and in 2011, she was able to leverage her scientific knowledge in IEA’s projects and helped to train High School Science teachers in experimental and scientific inquiry. Hoda started her career working on a poultry farm where she discovered her love of molecular science. Her dedication and enthusiasm landed her a job with the American University of Beirut (AUB) where she worked in a virology lab. Her work in the lab inspired her to pursue Bachelor and Masters degrees in Animal Sciences AUB where she later served as a lecturer delivering courses in physiology and a virology. In the mid eighties she moved to the US where she held increasingly senior roles with companies and institutions specialized in life sciences and biotechnologies including the University of Massachusetts, Covance, The American Type Culture Collection, The J. Craig Venter Institute and the National Institute of Health. She also found time to completed a Master of Science in Biotechnology at the Johns Hopkins University in Baltimore Hoda is an accomplished author and public speaker. She is fluent in Arabic, French, English and Italian and enjoys jewelry design and artisan jewelry production. Kelly has worked with IEA since 2000 when she initiated the iEARN program in Lebanon and helped to design and establish the first YouthCaN Med program. She now serves as an external evaluator with IEA as well programmatic research and M&E. Kelly has spent 15 years working in international development and education. As an educational practitioner, Kelly’s work has taken her to the Middle East and South Asia where she worked with bilateral and multilateral aid organizations including UNESCO, UNICEF and DFID. Kelly spent the first five years of her career based in New York City where she worked first as a school teacher (primary and secondary), and then as part of a small team that helped pioneer the development of online education programs for teachers and students. Kelly completed a PhD in Education Research at King’s College London (UK) during which time she spent a year in Pakistan researching conceptions and practices of education across key policies, multilateral and bilateral aid organizations, government ministries, NGOs and social movements throughout Pakistan. As part of this effort, she interviewed and spent time with staff from dozens of development organisations in the cities of Karachi, Islamabad, Lahore and Gilgit and rural areas of Sindh. As a lecturer in Education and International Development at the University of Bath (UK) Kelly spent four years instructing and mentoring undergraduate and postgraduate students through courses on education, international development, and social research methodologies. Kelly has delivered lectures, workshops and teacher training programs for a wide range of audiences around the world. She is a recognized thought-leader in her field and is both an accomplished author and public speaker. Kelly is married, with one little boy and enjoys hiking, running and playing the piano. Paige has worked closed with IEA in its Raspberry Pi for Learning project designing curriculum and training teachers and in the design of the Coder-Maker program. Paige is a native of Oregon, and has graduated from Wheaton College with a degree in both physics and environmental science. While Paige was in college she had the opportunity to work at a local middle school through an NSF grant and from there began focusing on science education. Upon graduation Paige worked for a non-profit education company, The Odyssey Project sailing on a tall ship and communicating with students throughout Europe and Japan where she realized she wanted to become a full time high school science teacher. Paige received her masters in science education from The City college and has taught the last seven years in a transfer high school in Bed-Stuy Brooklyn while participating as a S.T.E.M. fellow for the New York Hall of Science and performing research at Columbia University in nanotechnology. Professor Mounir Mabsout, American University of Beirut and Department of Civil and Environmental Engineering Chairperson, Faculty of Engineering and Architecture and Director of the Center for Civic Engagement and Community Service (CCECS). Rory has 20+ years experience working with international relief and aid organizations, nonprofit corporations, and private enterprises in the United States, the Middle East and South Asia. His background includes 4+ years serving as a Regional Program Officer with the United Nations where he delivered a multi-year, multi-million dollar education initiative at community colleges and vocational education centers in the West Bank/Gaza, Jordan, Syria, and Lebanon. In addition, he worked for 4+ years in the West Bank/Gaza where he taught secondary education and served as youth worker, and he 6+ years of experience overseeing and managing USAID, State Department, and private sector grant programs from the United States. During his career he has filled supervisory roles with responsibility for program development and implementation, finance and reporting, and monitoring and evaluation. He has managed donor and other stakeholder relationships, represented both donors and aid recipients at multilateral meetings, and he has lead multi-disciplinary and multi-cultural teams working across regional zones of operation. Rory received a Master of Arts in from Johns Hopkins University in 1998 with concentrations in both International Development and Middle East Studies. Maher brings a wealth of expertise to IEA where he has been involved since 2009-10. Maher managed the I-DO project and later on the Raspberry Pi initiative and the Raspberry Pi for Learning project. Maher is a graduate from the American University of Beirut (AUB) with a degree in Computer Science. He has over 11 years of experience ranging from pure technical roles to sales, management and consultancy roles. Maher has been active in the digital economy ecosystem taking on the role of advisor for the Minister of Telecommunications HE Nicolas Sehnaoui for innovation and digital economy as well as being an entrepreneur in the ICT sector in Lebanon. Since 2003, Simon has been involved with IEA in various projects and currently heads IEA’s STEAM Research Lab (Science, Technology, Engineering, Arts, Math) where he invents exciting prototypes and projects and develops teacher-training programs. Simon is also a science educator at the American Community School at Beirut (ACS). He has graduated from the American University of Beirut with a Master of Science degree and has taught at university level for many years before shifting to teaching in schools. Simon has long years of experience in science teaching from grade 8 to 12 in the three subjects, Biology, Chemistry, and Physics. He regularly participates in local and international conferences, attending and presenting on the implementation of STEM approaches. He has successfully completed the NSTA/NASA online course “Teaching Tomorrow’s Engineers” and has expanded the STEM methodology to include coding, electronics, and robotics, thus preparing students for additional challenges and for the real world. 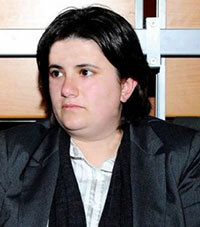 Hiba has over 13 years of work with IEA. She coordinates iEARN Lebanon in Saida and facilitates the Arabic Global Teenager Project Learning Circles. She has developed and delivered numerous online teacher professional development courses and works closely with teachers on ICT in the classroom, classroom videos, media, online collaborative projects and Learning Circles. For the past two years, Hiba has become a lead trainer in the introduction of coding and making using the Raspberry Pi in the Raspberry Pi for learning and in the Coder-Maker program. She has invested herself in learning about the Raspberry Pi, Scratch and Python and developed Coder-Maker projects. In addition, she heads the ICT department at the Hajj Bahaa Eddine School and is responsible of the strategy of ICT at school and supports teachers to make effective use of technology in classroom. Hiba has a BA in information, documentation and technology from the Lebanese University and a teaching diploma and an iEARN Master Teacher certification. Bader is a senior programmer and web developer with an outstanding track record particularly in technology applications in the education field. He has been involved with IEA since 2010, providing technological support and more recently web development. He has played a key role in the set-up, installation and support of the Raspberry Pi labs with remote and ongoing support to all sites. His creativity and entrepreneurial thinking provide innovative solutions particularly to technical problems on the field. He is also a valuable support to the development of coder-maker projects for STEM projects on the Raspberry Pi. Bader has a BA in Information Systems from the Beirut Arab University and has completed 4 Cisco CCNA certification.